Each week, as regular readers know, we pose a series of questions to a winemaker. This week, we’re featuring Gary Warburton from Napa Valley’s Phifer Pavitt. 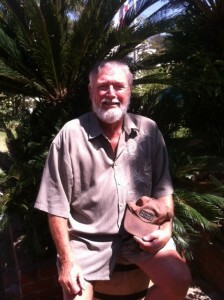 A California native, Gary spent most of his winemaking career as a hobbyist. His first efforts were in southern California, where his friends owned a small winery. The work inspired Gary to begin making his own wines, but for 15 years, he was simply a garagiste – making wine at home, mainly for family and friends. By day, Gary worked as a dentist. In 2001, Gary’s son, Shane, purchased 23 acres of land in Napa Valley together with his wife Suzanne. They hoped to one day turn their property into a vineyard – but quickly began making wine with purchased fruit. That’s when Gary decided to start taking weekend viticulture classes at U.C. Davis to pursue a degree in enology. Today, Gary assists Pfiger Pavitt’s head winemaker, Ted Osborne, and oversees the entire production of Phifer Pavitt’s Sauvignon Blanc. Check out our interview with Gary below the fold. Harvest superior fruit and don’t mess it up. What I mean by that is I want to do as little as possible to change or manipulate the fruit. I like to allow the grapes to speak for themselves. We spend many days in the vineyard during the month prior to harvest. We look at the bunches for color and firmness. We feel the bunches and smell their fragrances. We taste the fruit and chew the seeds to assure that our fruit is at the perfect ripeness. Many winemakers, due to space and workforce availability, are forced to harvest when the sugar is to their liking yet the fruit itself is perhaps weeks from the perfect ripeness. I am lucky enough and small enough to be able to dictate the exact timing of our harvest. I then whole cluster press my whites and only destem the reds. We never crush. I like to treat our fruit with a light touch. I ferment cold and don’t fine or stabilize. I feel that the less the fruit is manipulated, the more it will shine in the bottle. My wife and I ordered take out Thai and opened both a German Riesling and a California Chenin Blanc. Normally when we open a bottle there is nothing left over to recork, but in this case we wanted to try both of these – so a half a bottle of each was left over. This past Saturday night here at the Warburton house featured the entire family — 14 in all — for my chicken, sausage, and seafood Paella. So naturally I opened a number of Tempranillos, featuring a few Spanish Riojas and one of my all-time favorites — my 2007 “garagiste” Tempranillo, made from Lodi fruit. So now I find myself with a number of half filled bottles of great Tempranillo well-preserved with argon and recorked for later this week. I love leftovers! Gary and his daughter-in-law, Suzanne Phifer Pavitt. Although I have not had the pleasure to speak to a number of the winemakers I would like to meet, I have to mention the following, beginning with Charles Krug who had the first vision of commercial wine in the Napa Valley in the mid-1800s. Then there is Andre Tchelistcheff who almost single handedly shaped the “California Style” of winemaking. We also must thank Mike Grgich for his great insights into winemaking and finally Francis Ford Coppola, not so much for his personal winemaking but for his efforts to preserve the Napa Valley winemaking spirit. I also want to mention Angelo Gaja not only for his excellent winemaking but for his efforts to promote viticulture and enology worldwide. 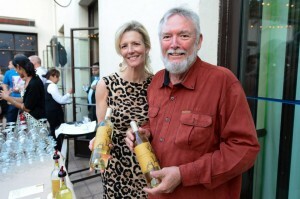 My favorite is Ashley Hepworth, winemaker for Joseph Phelps. Perhaps some may say I am biased since we were lab partners at UC Davis, but in being close to her I have to admire and try to emulate her passion for winemaking. Her cleanliness, organization and fierce integrity are a light in the Napa Valley. Ashley’s results speak for themselves and will for decades to come. Sailing in the British Virgin Islands, stand-up paddle boarding, and windsurfing. When in town I do building projects with my grandsons and try to spoil my granddaughter. Also, I have a passion for cooking. The best was a 1988 Sassicaia. When I drank it on the Tuscan coast, little did I know it was a 97-point Wine Spectator selection. The most interesting was an Arneis that was introduced to me in a very small “underground” wine bar in the village of Neive, Italy, just a few miles from Barbaresco. The vineyards outside the village grew almost solely Arneis fruit and they were trying to reintroduce this varietal to the world. I was so impressed with the flavor and crispness that I actually found one grower in the United States, in the Santa Ynez Valley, who had a few acres planted in Arneis and was willing to part with half a ton for my garagiste efforts. Oldest is a 1945 Margaux. This was the “year of the century” in Bordeaux as well as my birth year. A real keepsake and not a drinking wine. However, it has been crossing my mind to bring it out in April of 2015. The most expensive is likely to be a 2005 Cheval Blanc. Is this a trick question? I make only one red and one white so I’ll go to them first! Phifer Pavitt Date Night Sauvignon Blanc and Cabernet Sauvignon are always on my table. I am quite sure that my Sauvignon Blanc would qualify as the white to complement all my meals where white is applicable. However, keep in mind that my wife and I, along with most of our guests, enjoy food of all descriptions. Perhaps our Phifer Pavitt Cabernet could be a little too bold for some of our gastronomic cravings. So if I may cheat just once I would have a Grenache handy for some occasions. My biggest challenge is to source the best fruit for our wines. I work very hard to insure that my incoming fruit meets all my requirements. I love the Piedmont area of northern Italy. Alba and its surrounding villages generate so many magical feelings as well as magnificent wine. My penmanship is horrendous. My spelling is embarrassing. That said, I can get a 90-foot Maxi racing sailboat over the starting line first on a consistent basis. Who said I was making wine for a living?! At the moment and for the foreseeable future I am developing the infrastructure for the winery, securing the contacts necessary to harvest the best fruit, assisting with marketing, and making the best wine possible. For now this is my real, full-time job. I plan on leaving the “for a living” part to my grandsons. In the meantime, for three days/week and for 30 weeks/year, I practice dental implant reconstruction. That’s the living part — winemaking is my passion and future. I define success as being able to follow your passion and live your dreams. I certainly am successful.